A Slovenian citizen of the Austro-Hungarian Empire, Franz Miklosich (1813-91) studied at the University of Graz before moving to Vienna in 1838. 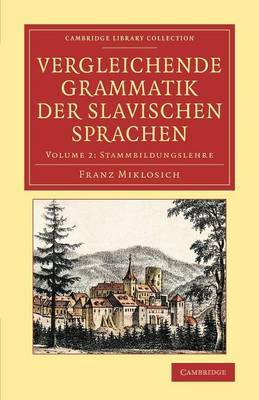 Indo-European philology was a growing area for research, and in 1844 Miklosich reviewed Bopp's Comparative Grammar (also reissued in this series) and embarked upon extending the comparative method across the whole Slavonic language family. Miklosich's work marked a watershed in Slavonic studies; in 1849 he became Austria's first professor of Slavonic philology. His publications included editions of historical sources; work on loan words, place names, and Romany dialects; a dictionary of Old Church Slavonic; and an etymological dictionary of the Slavonic languages (1886, also available). His four-volume comparative grammar of the Slavonic languages (originally published 1852-74, updated reprints 1875-83) was one of his most influential works. Volume 2 (reissued in the 1875 edition) explains Miklosich's views on Slavonic word roots and describes stem formation in each language.